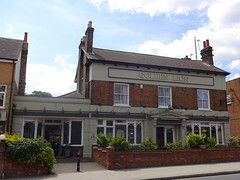 Enterprise Inns pub in Sydenham, run by the team behind the Cherry Tree in East Dulwich. It had a major refurbishment in July 2015. It's reasonably large and bright inside, with polished floorboards and pleasant white/peppermint green paintwork. The seating is split into two main sections to the side and front of the bar. Outside at the front there is a beer garden with a good view of the traffic on Sydenham Road. There's a slightly more secluded beer garden to the rear, and a function room. Kat and Rick paid a flying visit in March 2016. There were four handpulls on — Doom Bar, Courage Best, Black Sheep Holy Grail and Penpoint Cornish Coast (a Greene King collaboration). Two halves of the latter two beers came to £4.20; sadly they were both quite bland and flat-tasting. The rugby was playing on TV screens in both sections of the pub, though the sound was down in the front section, where pop music (Carly Rae Jepsen) was playing quietly instead. Kat's verdict: this pub is clearly aiming to attract sports viewers and gastro-inclined diners, rather than ale fans — sadly not my cup of tea. Accessibility: A small ramp to get in, then level to the bar and toilets. The toilet cubicles are reasonably spacious. Child-friendliness: There's a baby change unit in the ladies' toilet. Last visited by Kat and Rick, March 2016. Opening hours taken from Zomato, March 2016. Last edited 2016-05-26 14:09:07 (version 3; diff). List all versions. Page last edited 2016-05-26 14:09:07 (version 3).